Available Worldwide as a Single or Double and now for 2019 also available in LIGHT WEIGHT. 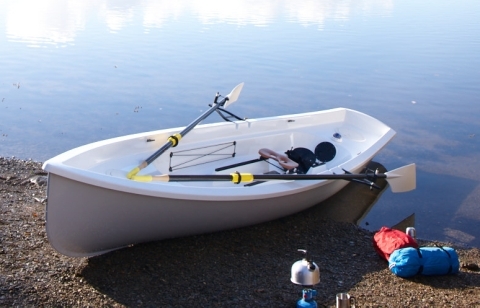 The Westport Nordic Explorer for Training and Recreational Rowing. The Nordic Explorer is perfect for getting out on the water in all conditions. Whether you are training for sculling or just want to relax in our wonderful marine environment, enjoy a picnic or just to keep fit and healthy, take a look at our Nordic Explorer. The term ‘Jolly Boat’ refers to small boats carried by British sailing warships, used for small tasks and duties including the transfer of people and goods to and from shore. We have taken the hull lines of these traditional seaworthy boats as inspiration, mixed in the fine lines of the sea going 'Pilot Gigs' of the British Isles South West and added a taste of the ‘Thames Rowing Skiff’, leading to a sleeker and faster boat that still retains the stability, load carrying and seaworthiness of the original designs. 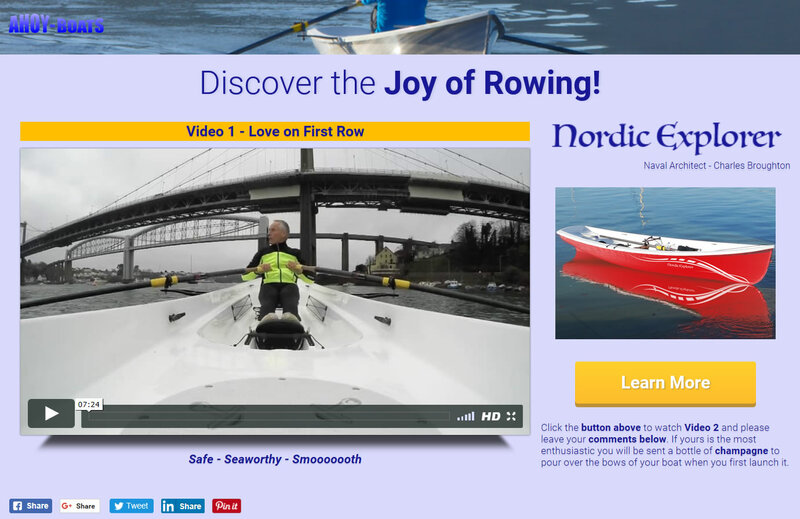 Our Nordic Explorer is extremely easy to row, whether you are 7 or 70 years old, jump aboard and you will be rowing with confidence in no time at all. Her traditional and graceful lines hint at her seaworthiness and surprising speed making her at home on the river, loch, estuary and sheltered coastal waters. Her layout is practical, utilising folding riggers for coming alongside making getting in and out as well as rigging quicker, easier and safer. Large lockers forward and aft for dry storage and handy elastic deck netting for those items that need to be at hand keep her practical and easy to use. Her generous freeboard and self-draining deck instil a feeling of confidence making her relaxing and enjoyable to row. The Nordic Explorer is now available as a single or double. The Double has three rowing positions, allowing balanced rowing as a single, single with passenger or double. Register your interest in a Nordic Explorer with Steve at Ahoy Boats and we will keep you up to date with offers, video clips and our our exploits with our own boats. Folding Riggers: Our folding rigger arrangement has been optimised for strength, weight and practicality. When folded they have been arranged to tuck just outboard of the tracks so as to provide the minimum of intrusion making coming alongside and getting in and out of the boat simple, safe and easy. 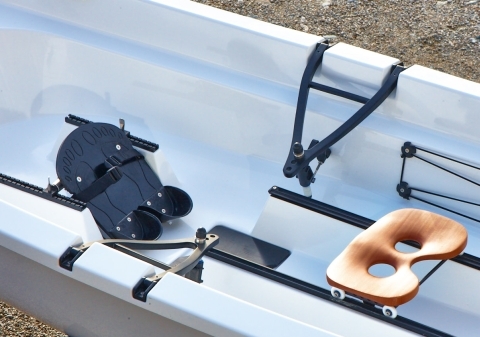 Our development boat proved just how practical this feature is by eliminating all of the pre-rigging normally required – fold the riggers and skulls inboard for storing and outboard for using the boat - simple! Standard Club and Racing Rigger Geometry: For those already rowing or for those who intend to row in 'fine' club training & competition boats, the Jolly Boat has the same standard rigging geometry. Novices can learn and practice the various aspect of the stoke in a relaxed and unhurried environment of the Nordic Explorer, then progress into the narrower 'fine' club boats. Experienced rowers can also enjoy the Nordic Explorer as it gives them access to a much broader spectrum of waters in which to enjoy rowing. The Nordic Explorer has been designed with a stronger hull and deck structure perfect for cruising, tours and the kids! Self-Bailing Hull: The deck drains to the bilge sump where a self-bailer can be used to drain away any collected water, even when stationary! Side Storage Deck Elastic: Used for keeping items to hand when rowing, i.e. jumpers, drinks, charts, etc. Forward and Aft Crew Seating: The deck mould has been designed with forward and aft seating moulded in for additional passenges - so no excuse for that gentle row up river for a quiet picnic with friends. Double Bulkheads: The hull is kept rigid and split into three buoyancy compartments by two bulkheads, with the forward and aft compartments forming large, natural storage areas. This arrangment along with the self bailing capacity satisfy current FISA Coastal Rowing Regulations. Side Buoyancy: There is over 300kg of reserve buoyancy split between three compartments (formed by the two bulkheads). By careful design buoyancy has been kept in the sides as well as forward and aft to maintain stability even when swamped. In the unlikely event of a capsize or when boarding from the water the additional side buoyancy also ensures minimum water ingress, improving stability and safety. Dry Storage Lockers: The two forward and aft compartments form natural storage lockers accessed through two standard 6” watertight access hatches, with the option of fitting additional 10” hatches for storage of camping and touring equipment. 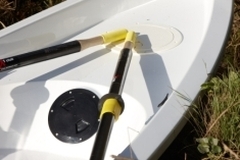 Mooring Cleat Location: The forward and aft mooring cleats are located within reach of the rower to allow easy mooring when coming along side. Adjustable Foot Plate: The foot plate is adjustable to allow the correct set-up for the shortest and tallest rowers. Gunnel Return: The gunnel (deck/hull edge) has been specifically designed to turn water travelling up the hull, away and down - reducing spray and water on the deck as well as increasing gunnel strength. This arrangement is also idea for carrying the boat when ashore, so no need for fixed handles. 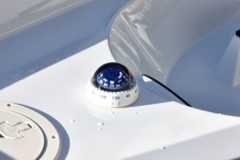 Bow Eye: The bow eye is fitted as standard and allows for the securing of the boat for towing when afloat or tieing down when ashore or on a trailer. Transom Design: The transom has been kept flat allowing the simple addition of wood pads when fitting a Rudder or Outboard Motor. Keel Band: The Keel has been fitted with a low-friction keel band to help protect the hull during beaching and allow easier manoeuvring and storage of the boat. Quality: Every aspect from design and manufacture to appearance and finish has been carefully considered, ensuring the best quality and long life.